Unless your podcast is based solely on your own charm and wit or you have a lot of local talent willing to stop by your studio, there will be occasions when you need to record interviews remotely. While there are a handful of ways to do this, one of the most popular is making a call over the Skype VOIP service and recording the results. It’s popular not only because Skype-to-Skype calls are free, but because Skype generally has good voice quality and there are a variety of tools for capturing Skype calls. Here are the steps for using one of those tools. After downloading a copy of Skype and setting up an account, additionally download and install a copy of Ecamm Networks’ $20 Call Recorder. This is a Skype add-on that makes it very easy to capture both sides of a Skype call on separate tracks. When you launch Skype, a window will open that asks if you’d like to configure Call Recorder. Click Yes. This opens Skype’s Recording preference pane. It’s within this window that you can configure Call Recorder’s audio and video settings. Choose Uncompressed in the Audio Encoding pop-up menu and your Skype calls will be recorded in AIFF format, which result in quite large files. If you’d like good sounding files that don’t take up as much space, choose AAC Compression from the Audio Encoding pop-up menu and High from the Audio Quality pop-up menu. As we’re not recording video, leave the video recording options as they are and close Skype’s Preferences window. A small Call Recorder window will appear. Make or receive your Skype call. (Call Recorder works regardless of who initiates the call.) Listen to the person on the other end of the call and feel free to advise them if their volume is too low, too high, or they’re put their headset microphone too close to their mouth, resulting in a lot of popped Ps and Bs (called “plosives”). With some adjustment in their position, or the position of the mic, they can deal with these issues. Although you have little control over the kind of microphone your guest uses, you should be sure to have a decent microphone in front of you. Inexpensive headset mics generally produce poor results. I prefer a good quality USB tabletop microphone or a "standard" XLR microphone mounted on a boom stand. Such microphones are available from a variety of manufacturers. 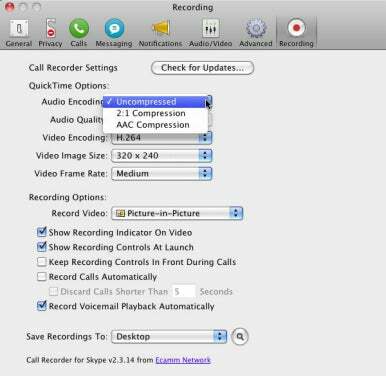 When you’re ready to record the call, simply click the red Record button in the Call Recorder window. When you finish, click that same button, which now bears the Pause symbol. By default, Call Recorder will save your call in a Saved Calls folder on the Desktop. Within that folder you’ll see a .mov file that includes the name of the person you called along with the date and time—Joe Blow on 2011-05-22 at 11.57.mov, for example. Although you could import this file into your audio editor, if you split the track into two separate tracks you can control the volume of each track. To do this, locate the Movie Tools folder that Call Recorder installed (found in /Applications). 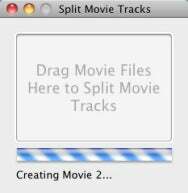 Open the Split Movie Tracks application and drag the .mov file you captured into it. The file will be split into two tracks—one containing your voice and the other having only the sound from the person (or people if you’ve recorded a conference call) on the other end of the line. Add these two tracks to your audio editing application. If you’re using GarageBand, just drag them into the application’s main window. They’ll be added at the same location and converted to AIFF files. Edit the podcast at will. While interviewing subjects in person is always optimal—you have the benefit of body language and eye contact as visual cues on when to speak and how to interpret the conversation—recording a telephone interview remotely with Skype and Call Recorder gives listeners a high quality recording at a very low overhead.